Regular movement is essential to boost blood circulation when standing for longer periods. Steppie® is the “best in class” wobble board designed by experts. Unlike other wobble boards, Steppie® encourages you to move with the correct pronation which avoids strains to the ankles, knees, hips and back. Steppie® is so comfortable you can stand for longer periods, which strengthens your back, gives you more energy and helps you burn more calories. Steppie can be used alone. We recommend it be used with either Steppie SoftTop or an anti-fatigue mat. 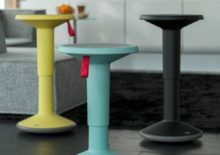 With variable height adjustment (45 - 63 cm) UP Stool suits all shapes and sizes. It also weighs only 6 kilos, so can be carried anywhere. Adjust simply, both up & down. Five colour variations. 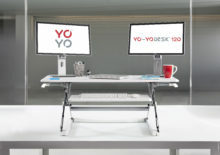 Yo-Yo Mat® is the anti-fatigue standing desk mat designed by experts. Yo-Yo Mat® encourages optimal movement whilst standing. Proprietary activeFeet™ technology reduces fatigue and dull ache associated with prolonged standing on hard surfaces. 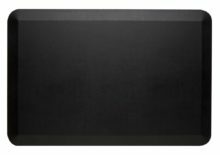 76cm wide and 50cm deep. Move more whilst standing!